For over a month, TechGeec.com has been completely inactive and this issue must be addressed. The reason for this is because this website is run solely by David Rocklin, founder and admin of TechGeec.com and owner of YouTube.com/TechGeec. Trying to find time to balance the various projects that I have currently taken on is difficult, thus, I no longer have time to update TechGeec.com – plain and simple. I hope to revive TechGeec.com in a short, undetermined time from now but until then it will remain on hiatus. You do not need to constantly visit us to know when we will be back up and running. Instead, subscribe to our RSS feed HERE and you will be notified when new articles are published. 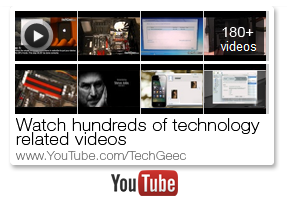 You can, however, continue to follow TechGeec (in a sense) on YouTube, Twitter, and the This Week in iOS podcast. Nevertheless, thank you to everyone who has followed us whether you have been with us from the beginning or not. Your continued support is truly appreciated. That's too bad, come back soon!